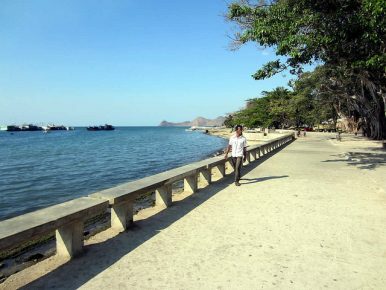 A waterfront promenade in Dili, Timor-Leste. After negotiations at the Permanent Court of Arbitration in The Hague, the governments of Australia and Timor-Leste have come to an agreement to terminate the current treaty over their disputed maritime border. The treaty, known as the Certain Maritime Arrangements in the Timor Sea (CMATS), signed in 2006, established a temporary maritime border in the Timor Sea after Timor-Leste received its independence from Indonesia and became a sovereign state in 2002. The CMATS treaty stipulated that there would be a 50/50 share in revenue from any of the oil and gas deposits that lie within the temporary maritime border region. This includes deposits within the Greater Sunrise Field, located in the disputed area, which are estimated to be worth around AU$40 billion (US$30 billion). The CMATS treaty also committed both parties to a 50-year freeze on negotiating a permanent maritime boundary. The median point between two countries has become an established modern practice for establishing a maritime boundary. This was codified in 1982 by the United Nations under the Law of the Sea, which provides for two countries to create a maritime boundary at the median point between each other. The establishment of a median line would place the majority of Greater Sunrise Field in Timor-Leste’s territory, and significantly increase its share of the revenues from any future extractions. Australia has continued to claim that the maritime border for mineral extraction should extend to the limits of its continental shelf, as was established with Indonesia in 1972, believing that Timor-Leste inherited this established line when it was invaded by Indonesia in 1975 (prior to this Portugal, as the colonial power, sought to establish the median line as the boundary). However, upon achieving independence, Timor-Leste won the right to negotiate its own boundary, and now wishes to follow the norms established within the Law of the Sea. With the termination of CMATS, the government of Timor-Leste will seek to establish a permanent maritime boundary as an essential component of its still newly achieved sovereignty. The CMATS treaty was initially created in order to enable joint development of the Greater Sunrise field; however, this arrangement is no longer deemed acceptable to Timor-Leste. As well as an attempt to complete its sovereignty in the region, there are pressing financial concerns which require the Timor-Leste government to exert this sovereignty. Timor-Leste’s state budget is almost entirely dependent on revenues from oil and gas extraction. The existing fields from which they currently derive this revenue are approaching depletion. Therefore the country is in desperate need of establishing new sources of revenue. Timor-Leste’s current move is to forgo the 50/50 split of potential revenues in the hope of achieving a far greater share should the median line be established as the permanent boundary. However, Australia has excluded itself from any compulsory dispute resolution proceedings, which means that Timor-Leste is unable to take Australia to an international court for a ruling on the countries’s maritime boundary. Negotiations over establishing a permanent boundary will have to take place bilaterally. The termination of the CMATS treaty can be seen as a significant victory for Timor-Leste in its ability to exert itself in the region. Yet the potentially more difficult next step will be to successfully negotiate with Australia for a median line boundary. For Australia the termination of CMATS is a shift in its previously adamantly held position, a move that probably had a bigger picture in mind. While negotiating a permanent maritime boundary within the current international norms may seem like a straightforward task that would benefit its smaller and poorer neighbor, in doing so Australia may trigger a desire within Indonesia to renegotiate its maritime boundary as well. Australia and Indonesia’s current treaty over its maritime boundary contains an odd facet with separate sovereignty over the seabed and waters above it, known as the “water column.” Australia’s sovereignty extends to the end of the continental shelf, giving it rights over minerals within the seabed. However, Indonesia’s rights to the water column extend to the median line between the two countries. Normalizing this situation to the median line for both the seabed and the water column may become an interest of Indonesia’s, if Timor-Leste is able to achieve the same outcome.